Is confusion a good way to encourage safer driving? 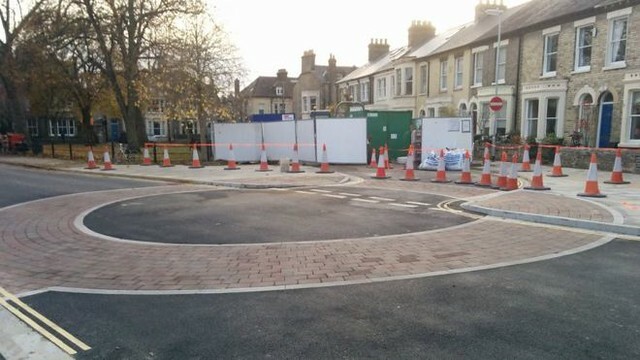 That seems to be the idea behind a new traffic calming ploy in Cambridge, England. The city reopened a remodeled street last week featuring what appears, at first, to be a roundabout. Look carefully, however, and you’ll notice that it isn’t a roundabout at all. It’s simply a circle of bricks laid into the street and adjoining sidewalk. It’s practical function is essentially nothing. Or is it? The city’s thinking is that drivers will instinctively slow down when they approach this ghost roundabout. When they get closer, they will realize they’re actually on a normal street, and accelerate—but in the meantime they will have slowed down and watched the road more carefully on what could be a potentially dangerous corner. As we prepare to circle, we might spare a cartographically-correct thought for Gerardus Mercator; he died on this date in 1594. The most renown cartographer of his time, he created a world map based on a new projection– the Mercator Projection— which represented sailing courses of constant bearing as straight lines, an approach still employed in nautical charts used for navigation. 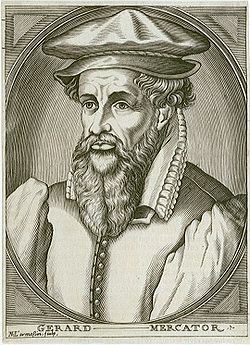 While he was most esteemed as the foremost geographer of his day, Mercator was also an accomplished engraver, calligrapher and maker of globes and scientific instruments. And he studied theology, philosophy, history, mathematics, and magnetism.